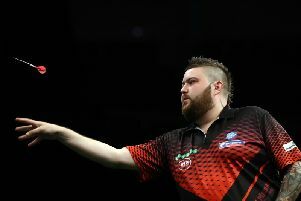 Michael Smith's hopes of reaching the play-off stage in the Unibet Premier Darts League are fading fast. The St Helens ace, who is propping up the table at this moment in time, will have to win the majority of his forthcoming matches in the competition - and rely on some of his rivals to slip up - if he is to reach the final for a second year in succession. He was on the receiving end of an 8-3 defeat against world champion Michael Van Gerwen in Liverpool last night (Thursday) but the final scoreline didn't tell the whole story. Bully Boy, who like the Dutchman averaged more than 100 throughout the match, could have won at least three more of the legs but wayward finishing cost him dear. Van Gerwen landed two 11-darters and a 12-dart leg as he opened up a four-nil lead, with Smith needing to land a pair of 12-darters to respond before finishing 70 to cut the gap to 6-3. The defending champion, however, powered in checkouts of 76 and 80 to seal a big win, maintaining his spot just a point behind former world champion Rob Cross ahead of their Cardiff showdown next Thursday, while Smith faces Welshman Gerwyn Price who will be playing on his home patch. "I knew I had to do something special tonight and and I did just that,'' said Van Gerwen. "My doubles were phenomenal and I put Michael under pressure from the beginning.